Amazing photo of two separate volcanoes erupting at the same time! While airborne at 37,000 feet over southern Italy (N39.5 E015.5) I had a very rare sight. In the distance was 10,924 foot Mt. Etna [wiki], mainland Europe's tallest active volcano, freshly erupting on Sicily [ wiki]. 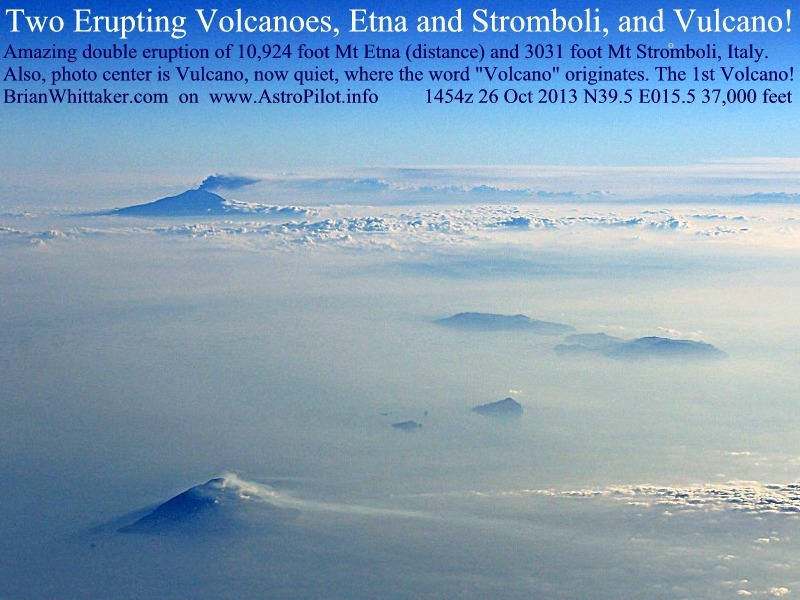 I have seen it smoking before [BBC] but this fresh eruption had only started today [News]. Below was smaller 3031 foot Stromboli [wiki] which has been surprising almost continuously active for about 2000 years! 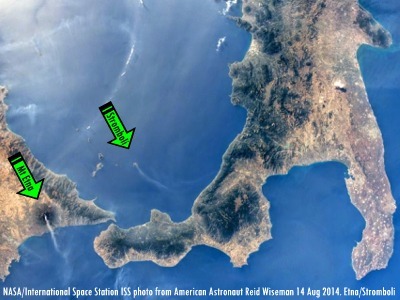 These smaller islands are part of a volcanic chain called the Aeolian Islands [wiki] in the Tyrrhenian Sea [wiki]. Incidentally, the 3rd active volcano in Italy is Mt. Vesuvius [wiki] which, although wasn't active on that day, is historically known for its destruction of Pompeii [wiki] in 79 AD. Interestingly, the flattish 1637 foot high island in the centre of the photograph is called Vulcano [wiki ], and by definition is the first volcano! It was the local hot-spot during the Roman days and was named by them Vulcano, a term that evolved and spread to eventually describe all volcanoes. The Romans had inherited the ancient Greek Gods which included Hephaestus [wiki], which they had renamed Vulcan [wiki]. He was the god of blacksmiths (metal craft/fire) and the volcano was thought to be the chimney of his furnace. Photo: (c) 2013 Brian Whittaker (.com) . See fair use policy. UPDATE: International Space Station ISS photo from American NASA Astronaut Richard Wiseman taken 14 August 2014 is shown above. His Internet Twitter release was well received globally. I have re-shown it here to illustrate the different perspectives between pilots and astronauts. He is in orbit between May and November 2014. [800x600] [Twitter] [ESA].